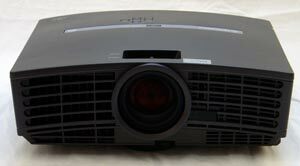 When Mitsubishi released the HD1000 in late 2006, they tapped the market for low-cost 720p DLP home theater projectors. Today, this market is incredibly popular, and offers great performance for the price. These 720p projectors provide a wonderful alternative to 1080p projectors, sacrificing very little performance for a fraction of the cost. Mitsubishi's newest offering, the HC1600, builds on the success of their earlier models and reaffirms Mitsubishi's place as a leader in the home theater market. The HC1600 is a 1700 lumen, 2500:1 contrast 720p DLP projector that produces a solid image. Accurate color and a bright, powerful image make the HC1600 ideal for photography and still graphics, but its 2x speed color wheel may hinder its application in video, sports, and gaming for those who are sensitive to rainbow artifacts. The HC1600 can be found for street prices around $1,000. High lumen output. The HC1600, after being calibrated for accurate color, produces 855 ANSI lumens in high lamp mode. This is partially due to the inclusion of BrilliantColor, which tends to emphasize highlights in an image and results in a much brighter white. This tends to make the image appear unbalanced, since highlights are so much brighter than colored portions of the image, and it can be distracting in scenes with a lot of fast motion. Turning off BrilliantColor provides a more balanced image, but drops lumen output to roughly 425. However, if you need that extra brightness boost, BrilliantColor can provide it. For applications that require even more light output, the HC1600 can go even brighter - up to 1257 ANSI lumens in "Sports" mode. Low lamp mode drops lumen output by 22%, so you can still get 980 lumens out of the HC1600 in low lamp mode. When it's time for that big game, invite all your friends and move the projector out into the living room. Color won't be as accurate or vibrant as it is in other modes, but if the extra light output is needed, you've certainly got it. Solid contrast. The HC1600 is rated at 2500:1 on/off contrast, which does not sound like much in the age of 10,000:1 1080p projectors. However, our test sample measured 498:1 ANSI contrast, which is very impressive indeed - on the level of much more expensive DLP projectors like the InFocus IN83. On/Off contrast measured out to 1300:1, which is typical for this class of projector. However, note that BrilliantColor has the effect of boosting both ANSI and on/off contrast, so contrast performance with BrilliantColor disabled will not be as dramatic. Balanced color. At its optimal settings, the HC1600 has very good color balance and grayscale tracking. While not as accurate as some higher priced models, it still provides a balanced, vibrant image which is great for video games, film, or photography. Price. The HC1600 is strong when it comes to performance for the price. For those on a budget or exploring the world of home theater projectors for the first time, the HC1600 is an affordable, entry level product. While the MSRP is currently $1495, street prices are slightly under $1000. Replacement lamps cost roughly $380, and should last up to 3,000 hours. Placement flexibility. Like many DLP projectors, the HC1600 has a 1.2:1 zoom lens and no lens shift. It will throw a 100" diagonal 16:9 image from 11'11" to 14'6", and at this screen size the bottom edge of the image will appear 16.4" above the centerline of the lens, or about 33% of the image height. This makes the HC1600 suited for ceiling or coffee table mounts, but it also makes rear shelf mounting somewhat difficult without using keystone correction. Color separation artifacts. One issue we noticed with the HC1600 was the more frequent appearance of rainbows compared to other comparable projectors. This is partially due to the HC1600's high brightness, but most of the blame can be placed on its 2x speed color wheel, which is unusual in home theater products. 2x speed wheels are typically used in business projectors, since static imagery is much less likely to induce rainbows than motion video. Suffice it to say that if you are sensitive to rainbow artifacts, you'll want to audition the HC1600 before purchasing if at all possible. Poor performance over VGA. During testing, our test unit consistently showed weaker color performance when using the 15-pin VGA port than when using component or HDMI. The HC1600 also locks the color saturation menu option when using VGA, which exacerbates the issue significantly. We ran the same selection of photographs in succession through VGA and HDMI, and it was clear that the HC1600 gave a far superior image when using the HDMI connection. To see how the HC1600 fared against its competition, we put it head to head with the Epson Cinema 720, a 1600 lumen 720p LCD. Both of these projectors provide low-cost alternatives to 1080p projection, and deliver exceptional image quality for the price. Both can be used in a traditional theater environment or a brighter living room for sports or video games. However, there are some key differences. Lumen output and color. With home theater projectors, the question is rarely "How bright can I go?" and much more often "How bright can I go without sacrificing color?" With the HC1600, you can have great color at 855 ANSI lumens, but this comes with a caveat. The presence of a white segment on the HC1600's color wheel produces an artificially high lumen rating. Our measurement of 855 ANSI lumens was taken on a pure white screen, which is not representative of a typical video signal. Color is not nearly as bright as highlights are, so the measurement of 855 ANSI lumens is somewhat deceptive. In real-world use, the image will appear to be in the 400 to 500 lumen range. Meanwhile, the Cinema 720 has wonderful, balanced color at 450 ANSI lumens, but trying to use the brighter "Cinema Day" setting at 750 lumens does a number on color accuracy. For this reason, we consider the two projectors evenly matched on this front. Connectivity. The HC1600 and Cinema 720 are more or less tied here as well, with HDMI, component, 12V trigger, and VGA, though using VGA on the HC1600 is not advised for the reasons mentioned earlier. The Cinema 720 also sports a D5/SCART connector, while the HC1600 has a USB port. Contrast. The Cinema 720 has much higher on/off contrast than the HC1600, due to the inclusion of an auto-iris. However, the HC1600 has excellent ANSI contrast, so in many scenes it appears to the viewer's eyes to be higher in contrast than its LCD competition. Part of this is due to the effects of ambient light, which makes black levels between the two seem more or less identical despite the Cinema 720's laboratory advantage. In a perfectly dark room, the Cinema 720 would have an edge in some scenes, but for most real-world applications, the HC1600 prevails. Sharpness. The HC1600 appears to have a significantly sharper image than the Cinema 720, both due to actual sharpness and higher contrast. The end result is that the HC1600 appears crisp and clear in every single scene we threw at it, while the Cinema 720 can sometimes appear slightly soft in comparison. Placement flexibility. In the easiest category to judge, the Cinema 720 has a 2.1:1 zoom lens and vertical/horizontal lens shift, while the HC1600 has a 1.2:1 lens and no shift. The Epson Cinema 720 takes this one, hands down. However, be aware that long zoom lenses can cause some significant curtailing of the light output; in the Cinema 720's case, you end up losing roughly 45% of total light output by using the telephoto end of the zoom lens. This is something you don't need to worry about when installing the HC1600, but then again, there are many installations that the HC1600 can't accommodate and the Cinema 720 can. Lamp replacement cost. While not an immediate concern, lamp replacement is something best planned for in advance. Replacement lamps for the Cinema 720 cost about $350, while lamps for the HC1600 cost roughly $380. How does the HC1600 stack up against its predecessor, the HC1500? If the specs are to be believed, the two are identical, save that the HC1600 is slightly brighter. They use the same case, the same lamp, the same lens, the same zoom, the same warranty, and they have the same price. However, the specs don't tell the whole story. Color wheels. The big difference between these two projectors is in the color wheels. The HC1500 has a 4x speed, 7-segment color wheel (RGBRGBW). The fast refresh rate significantly reduces the odds a user will see rainbow artifacts while providing well-saturated, accurate color. The HC1600, on the other hand, has a 2x speed 5-segment color wheel (RGBWY). The advantage is that there is a noticeable increase in lumen output. However, color accuracy is compromised a bit and, if you are among those who can see rainbow artifacts, you will see them much more readily on the HC1600 than the HC1500. Lumen output. The HC1500 measured 660 ANSI lumens when calibrated for home theater use, while the HC1600 measured 855 lumens in its best calibrated mode. Both the HC1500 and the HC1600 could be made brighter by using "Sports" gamma, but the HC1600 retains a brightness edge in all comparable modes. Other than these two factors, the HC1500 and HC1600 are nearly identical. For those who cannot see rainbow artifacts on 2x wheels (and that is the majority of the population), the HC1600 will be an excellent low-cost choice for home theater, photography, and other content requiring widescreen display. However, if you are sensitive to rainbows, they can diminish the viewing experience of a movie or video game. Our recommendation for everyone thinking about using any DLP projector with a 2x wheel for movies and video gaming is to audition it first before committing to buy. The Mitsubishi HC1600 is a bit of an odd duck. It has high lumen output, excellent ANSI contrast, quiet operation, and good color balance. However, the 2x speed color wheel will be a problem for some who want to use it for home theater. All in all, it is a great entry level projector for photography and still content, and it does perform admirably in video, HD sports and video games for those not susceptible to rainbows. At street prices under $1000, the HC1600 will be a solid choice for many looking for a good projector that won't break the budget.